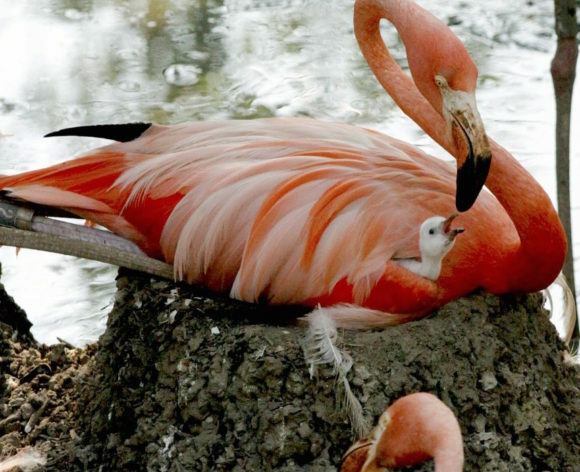 Hatched just before Dollar Day in 2011, chick Buster was our first Caribbean flamingo baby in more than two years. 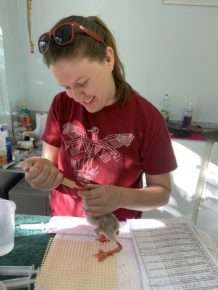 Bird keeper Marnie Bacon guest-blogs on Zoohoo! Dallas Zoo’s summer Dollar Day in 2011 was a hot and crowded one — and one our bird department will never forget. Spotted in the ZooNorth flamingo pond was a hours-old Caribbean flamingo chick. 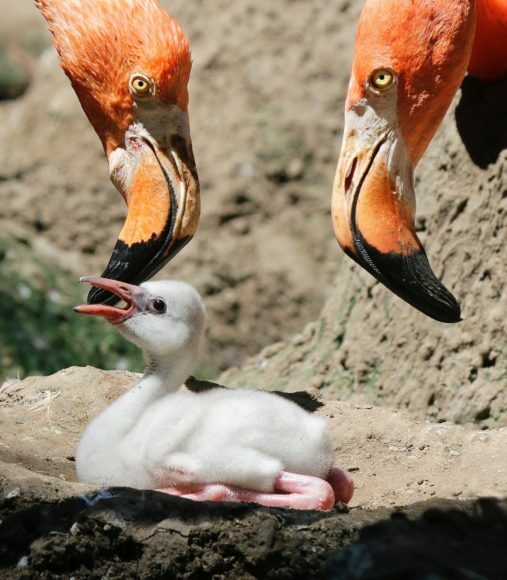 The little one hatched that day, making it the second Caribbean flamingo chick to hatch at the Dallas Zoo in more than 20 years. We named the first chick Buster, and our Dollar Day girl Georgia (after George Washington on the dollar bill, of course). We were so proud to have hatched these chicks, and today, they’ve come a long way. Today, Buster is fostering his own chick. 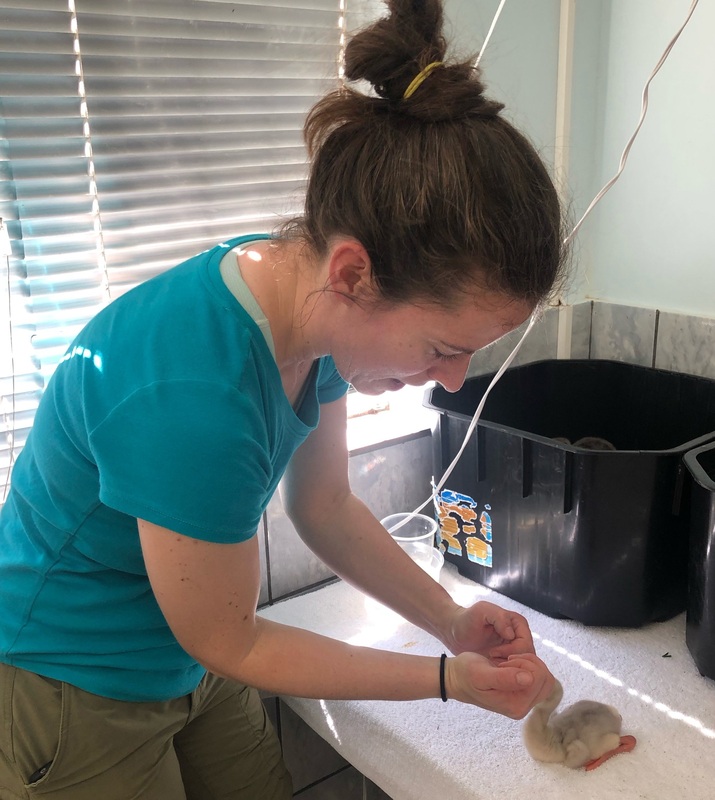 This year’s Caribbean flamingo breeding season started the same as previous years — with a lot of hard work by the keepers to get the birds’ nesting area ready. Our close observations of the flamingo flock’s behavior year after year resulted in the knowledge of the ideal conditions needed for a successful season: building a moat, tilling the soil, and keeping the area desirable for flamingos to nest build. This year, the birds built 30 nests and laid more than 20 eggs. 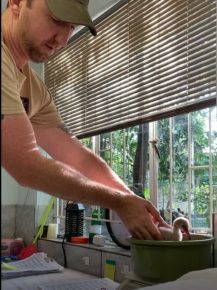 To safeguard the eggs, we carefully collected all of them to be artificially incubated and provided the adults “dummy” or artificial eggs to incubate. eggs was selected and provided the opportunity to raise a chick. But there are more than 60 flamingos in our habitat — so how do we choose? 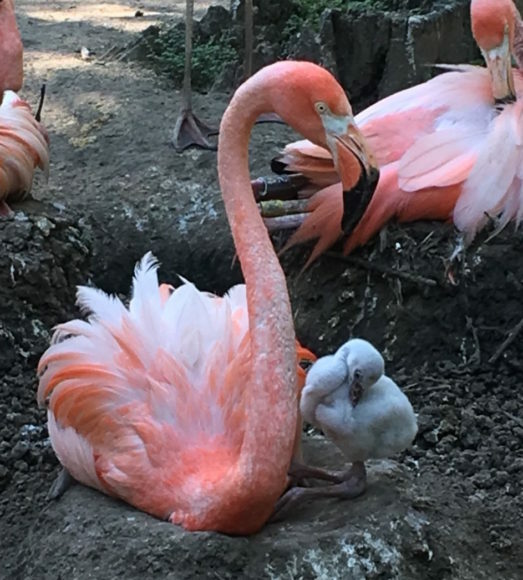 Dallas Zoo’s successful breeding season has brought four new chicks to the Caribbean flamingo pond! There are various factors that go into the decision process. Whether or not the pair is incubating a dummy egg, the timeframe in which the egg is hatching, and the behavior of the adults are all the main factors. It always makes us a bit nervous providing the opportunity to new parents, as we don’t know how they will do — but careful monitoring and proper surveillance by keepers ensures that the process goes smoothly! This year, after weeks of relentlessly defending their nest mound, Georgia and her mate welcomed a very special chick who, coincidentally, hatched on Dollar Day. 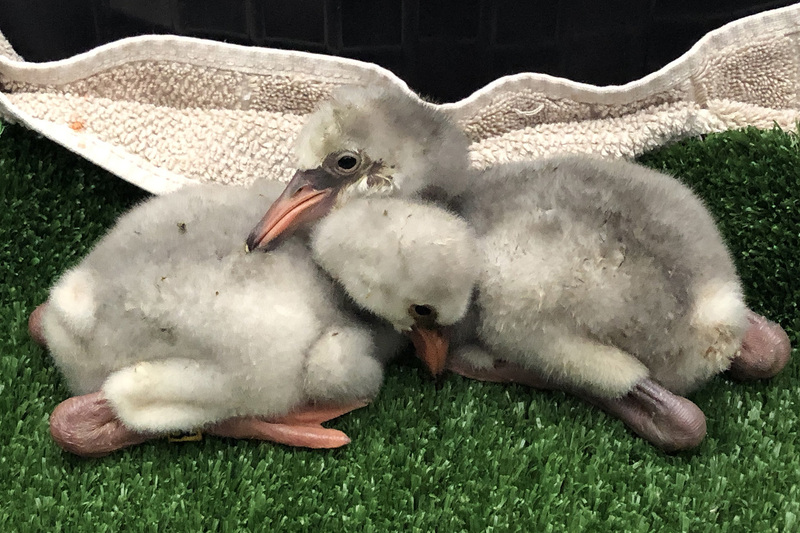 Buster and his mate were also carefully selected as a foster pair and are also now the proud foster parents to a chick that hatched on July 6. Six years after that fateful Dollar Day, things have come full circle and these two birds now have chicks of their own! Come out to the Dallas Zoo and see these babies, and our two other chicks, grow up in the Zoo North flamingo pond.